The world's forests have a major role to play in the transition to a greener economy, but governments need to do more to ensure they are sustainably managed, according to a new report from the United Nations Food and Agriculture Organization (FAO), issued today. “Forests and trees on farms are a direct source of food, energy, and cash income for more than a billion of the world's poorest people,” said FAO’s Assistant Director-General for Forestry, Eduardo Rojas-Briales, in a news release on the report. “At the same time, forests trap carbon and mitigate climate change, maintain water and soil health, and prevent desertification. The sustainable management of forests offers multiple benefits – with the right programs and policies, the sector can lead the way towards more sustainable, greener economies,” he added. The report, The State of the World’s Forests 2012 (SOFO 2012), will be officially presented at an event organized by FAO and its partners at the United Nations Conference on Sustainable Development (Rio+20), taking place in Rio de Janeiro, Brazil. Rio+20’s high-level meeting runs 20-22 June, and is expected to bring together over 100 heads of state and government, along with thousands of parliamentarians, mayors, UN officials, chief executive officers and civil society leaders, to shape new policies to promote prosperity, reduce poverty and advance social equity and environmental protection. SOFO 2012 makes the case that better and more sustainable use of forestry resources can make a significant contribution to meeting many of the core challenges being discussed at Rio+20. The report notes that investments in wood-based enterprises can generate jobs, create assets and help revitalize the lives of millions of people in rural areas. Some 350 million of the world's poorest people, including 60 million indigenous people, depend on forests for their daily subsistence and long-term survival, it adds. Despite sometimes having a poor reputation due to concerns over deforestation, wood products – if sourced from well-run forestry operations – can store carbon and are easily recycled, the FAO report states. It highlights how forest-based industries around the world are innovating competitive new products and processes to substitute non-renewable materials, and by doing so are opening pathways towards low-carbon bio-economies. The report also argues that sustainable forestry offers a renewable, alternative source of energy. “Burning wood may be the oldest method by which humans acquire energy, but it is anything but obsolete,” said Mr. Rojas-Briales, adding that wood energy is still the dominant source of energy for over one third of the world's population, in particular for the poor. “And as the search for renewable energy sources intensifies, we must not overlook the considerable opportunities for forest biomass-based energy to emerge as a cleaner and greener alternative,” he added. According to SOFO 2012, deriving energy from wood can offer a climate-neutral and socially equitable solution, provided wood is harvested from sustainably managed forests, burned using appropriate technologies, and undertaken in combination with reforestation and sustainable forest management programs. In addition, by both reducing deforestation and restoring lost forests on a large scale, significant amounts of carbon can be removed from the atmosphere, reducing the severity and impacts of climate change. SOFO 2012 also notes that putting forests at the heart of a new, green economy will require, first and foremost, policies and programmes that give entrepreneurs incentives to pursue the sustainable utilization of forest resources. 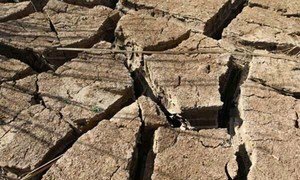 Top United Nations officials have called for greater efforts to preserve the soils on which human subsistence depends and to halt and reverse land degradation.